The station includes hanger arms to secure a bike while Webster bikers use the tools to perform basic repairs and maintenance. Webster University has added a new feature that makes it easier for students and employees who bike on or to campus. 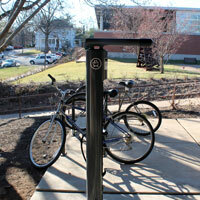 A new Dero Fixit Bike Service Station has been installed on the University Center patio on the Webster Groves campus to help Webster bikers perform basic maintenance. The idea for the station was proposed by student Juan Felipe Salas as part of a $1,000 Sustainability Coalition grant. Salas' grant was selected among others to receive the grant in 2015. The station includes hanger arms to secure the bike while individuals can use the array of hanging tools, including wrenches, screwdrivers and a bike lever, to perform basic bike repairs and maintenance, from changing a flat to adjusting brakes and derailleurs. 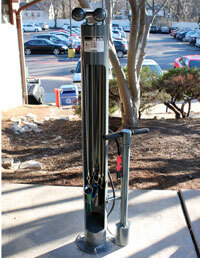 The station also includes a tire pump. pump and array of tools for basic repairs. The Webster University Sustainability Coalition promotes ongoing activities led by faculty, staff, and students on and off campus aimed at developing and implementing sustainability-focused goals. The Sustainability Coalition supports and encourages these and new initiatives to further achieve Webster’s mission, vision, and core values. The Coalition works to educate the campus community and our partners on sustainability issues, opportunities, and possible actions for solutions. The Coalition is an open, voluntary, stakeholder forum that anyone may join and contribute to the conversation and action for a sustainable campus and community. Open discussions about initiatives and projects brought forward are welcomed and encouraged through monthly meetings. Contact Kelsey Wingo, Webster University sustainability planner, at kelseywingo07@webster.edu for more information.